The Apprentice was mostly completed a full two years before it was released. Martyn's record label, Island, rejected the tapes of the songs in 1988, even though artistically they were not too far removed from his previous release, Piece By Piece. In fact, this album turned out to be the more cohesive of the two. Eventually released by Permanent Records, it's by and large a well-crafted collection of songs. Its only weaknesses are the sometimes too-strong dependence on synthesizers and the song "Deny This Love," which is Martyn doing bad dance music (and featuring a truly horrible a cappella introduction). Otherwise, it's an enjoyable album. "Look at the Girl" is a wistful follow-up to his 1974 song "My Baby Girl," while the haunting and moving "Patterns in the Rain" features Martyn's first recorded acoustic guitar playing in years (even though it's not very predominant). "Income Town" is an upbeat, more rock-oriented track, which has a sort of obscure in-joke added to it. Loud arena applause accompanies the beginning, though listeners will notice in the LP liner notes that the song is credited as being recorded at a club called the Green Banana in Toronto. Longtime fans will recognize this mythical club as a recurring Martyn joke. The Apprentice, along with Cooltide, caps off the smooth jazz sound of his 1980s albums, and is one of the best of this series of works. 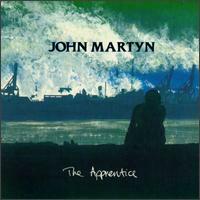 The Apprentice was released in March 1990. By February 1988 John had completed ten new tracks for a new album, but Island rejected the tapes. They parted company and John found himself without a recording contract and the backing of a major label. He continued to tour on a shoestring, with a solo tour in late 1988 and another tour in the Spring of 1989 augmented by Foster Paterson. No programmes, no merchandise, just the music in small venues across the country. John signed to Permanent Records but unfortunately this proved to be a far from happy and permanent arrangement. However, the album is confident and extensive use was made of synthesizers and samplers on the fierce disco beat Deny This Love which achieved a good amount of air play. More subtle blends and instrumentation were evident on The Apprentice, Send Me One Line and the vastly underrated The Moment (The Moment is only available on the cd version). Look At The Girl is a song about John's now grown up daughter Mhari and Patterns In The Rain features John's acoustic guitar playing for the first time in many years. Income Town is apparently live from The Green Banana in Toronto but this is in fact dubbed. In August 1990 a remix of Deny This Love/The Apprentice (live) was released as a 7 inch single. A cd single was also released with the album version of Deny This Love as an additional track. Send Me One Line was also released with Patterns in the Rain on the B side.